← View 358: Spring, Finally! Wooden and metal art sculpture of a serpent named Walt, the Loch West Monster, found along the Creekwalk in Syracuse, New York. Nikon D750/24-120VR, 1/250s, f/8, ISO 100, 24mm Focal Length, Intensify Pro. 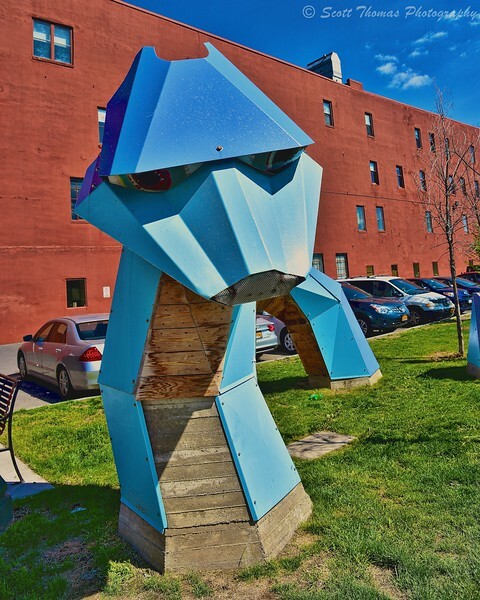 Walking on the Creekwalk near West Fayette Street in Syracuse, New York, I came upon the blue serpent sculpture you see here. An example of public art. I got curious as to the serpent’s origin, I did some snooping on Google. I found out the sculpture was given the name Walt, the Loch West Monster after a naming contest back in 2011. I used the Soft HDR filter in Macphun’s Intensify Pro to pull out the texture and shadows. This entry was posted in Travel, Weekly View and tagged 24-120mm, art, creekwalk, intensify pro, loch west monster, macphun, metal, new york, nikon D750, public, spring, syracuse, vr, walt, wood. Bookmark the permalink.